Lyoto Machida vs Phil Davis as the co-main event of UFC 163 - Jose Aldo vs Chan Sung. Watch the full video replay highlights from Machida vs Davis fight. If you can see the fight, you will be able to understand why Machida thinks that he won the fight since mma fighting site favored Machida as the winner of the fight via unanimous decision but it was Phil Davis who won the fight with the judges scorecards 29-28, 29-28, and 29-28 all for Phil Davis in all three rounds last August 3, 2013. 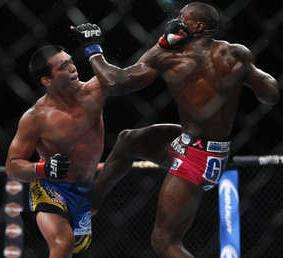 What we learned from this fight is that, Machida should not let it hands to the judges scorecards and decisions. He should go for a KO since he is the counter puncher. And for the judges, usually they judge the fight with some basic steps like who's the aggressor, who's fighter who would keep moving forward, and who's fighter who would be dictating the tempo. And the counter puncher is always behind these ways of judging a fighter which also happening in boxing not just in mma fighting. The full video replay highlights for Machida vs Davis fight of UFC 163 were available next time since the full video has been removed from public access. We're sorry but we will try our best to cover again the full video replay highlights of this fight.